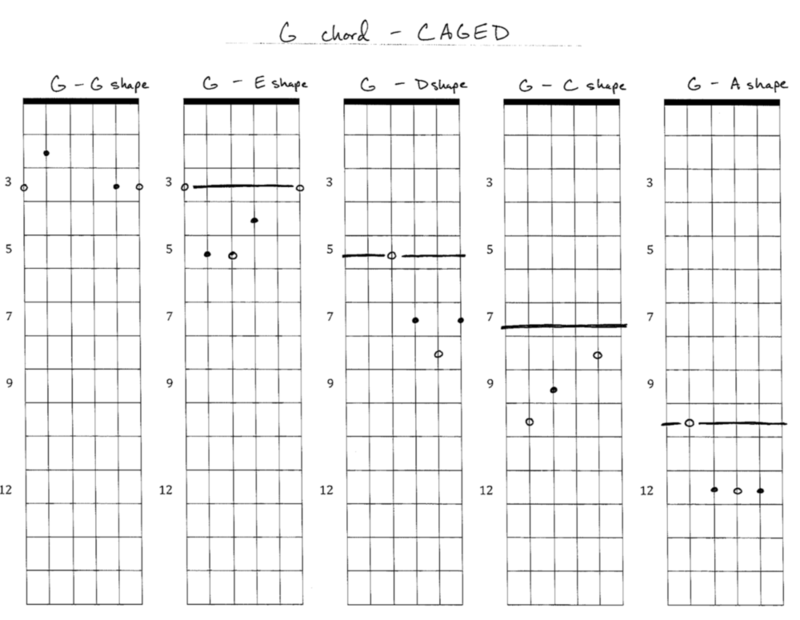 The CAGED sequence of letters (C-A-G-E-D) is the order that chord shapes move up the neck in the same key. You may have done this intuitively using a capo, but see how the chords, moving from the lowest on the left to the highest on the right move in the order of C-A-G-E-D looking chord shapes? To overstate it: in the key of C, as you move out of open position and up the neck, actual C sounding chords progress from the C shape* we know and love, to the A shape (placed at the 3rd fret making it an actual C chord even though it doesn't look like the C shape! ), then the G shape at the 5th fret, on to the E shape which is actual a C chord when placed at the 8th fret and finally, the D shape, which when moved to the 10th fret, actually becomes a C chord. It just repeats from there until you run out of frets. And it works that way for every single key. Well, then the next actual "G chord" up the neck would be - using the C-A-G-E-D sequence and seeing that we're starting on a G shape G chord in open position - the next actual G chord up the neck would be an E shape (3rd fret) . . . then a D shape (5th fret), then the CAGED word runs out of letters and starts over at C (7th fret), etc. See how it starts on G, moves to the next letter in the CAGED word, namely E, then D, then starts over on C, then A and so on? Again, it works this way in every single key. If you're in the key of E, start on the E of the word, CAGED, the next version of an E chord up the neck would be, using the CAGED word, a D, start over on C, then A, G, etc..
Find the lowest shape on the neck (an A shape, capo'd or barred at the first fret) and then. . .
you have your starting point to move through the word CAGED (If your lowest shape is A, then G somewhere would be next, then an E somewhere, etc). For any key, its always in that order. This can be hard to communicate outside of private lessons and actually showing you, but you can get and it is so, so important. Once you do get it, it really makes the neck of the guitar click for you. For acoustic players, this can help you really learn how and why to use a capo, not just because you have to, but creatively. For electric players, and really any guitarist, its just how the neck works. You can move around with much more confidence. My university students had to have this sequence memorized for all 12 keys and be able to demonstrate each key, moving from the lowest position to the highest practical position up the neck. You don't have to go that far, but you can absolutely wrap your head around this and find it useful. So, think it over, practice and questions are always welcome! Thank you for serving and for pushing yourself to learn! *I call them shapes because, though we’re used to seeing them in open position as a G chord, E chord, etc., every one of them is actually movable and becomes other chords when you moved them around (i.e. G looking chord, cope 3 is no longer a G chord - so, I talk about them as shapes instead). 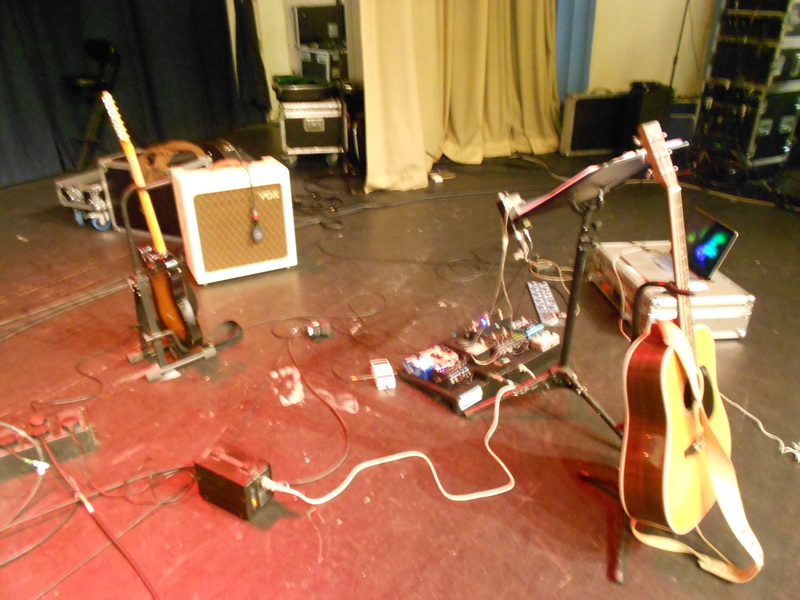 We've been looking at lots of things relating to your guitar playing. Well, we're going to take a little trip into some music theory that will serve as a huge resource for your playing. Its a practical, simple concept that will unlock chord progressions for you, help you transpose (change keys) on the fly and use a capo and not feel like you’re cheating. So, C is the first note in the key of C. D is the second, E is the third and so on. What would be the fourth? F, right? Good. So in the key of G a chord progression like G – C – D – Em would be what numbers (answer at the bottom of the post)? Chew on it for a little while. Start thinking about your chords in terms of numbers. In the next post we’ll take it a little further to look at how you can use this with songs and the different numbering systems (traditional and Nashville) that are used. Try it out on some songs and let me know if you have any questions! You can find part two, here. * G – C – D – Em = 1, 4, 5 and 6 in the key of G.